Allegheny Region is hosting their annual Mid-Ohio driver education weekend on Saturday and Sunday September 8-10, 2017. Allegheny Region driver education events always fill up fast, so register early. We would hate to see you on the wait list! 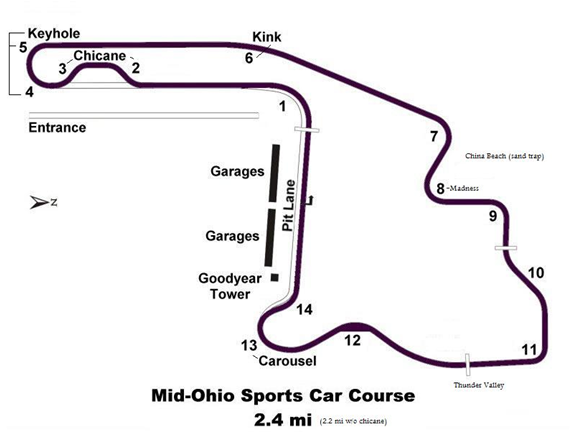 Mid-Ohio Sports Car Course is located near Lexington Ohio just off I-71 between Cleveland and Columbus. Like Watkins Glen, this track has a long history of hosting many major road-racing series dating back to 1962. 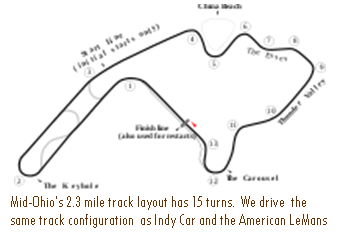 Although not known for its elevation changes like Watkins Glen, Mid-Ohio has been described by many professional drivers as one of the most technical and challenging tracks in the world. It will definitely put your car control and track management skills to the test! The trip to Mid-Ohio in September is beautiful… Put this on your calendar now! Participant Guide: (The Participant Guide will be posted two weeks prior to the event) Please review these materials before you arrive at the track. We prepare the Participant Guide to answer the most frequently asked questions. The Participant Guide will provide you with specific details about Mid-Ohio, PCA safety requirements, registration information, directions, access times, etc. How would you like to be a published author? Become the Club Reporter at Large for this event! The requirements… take a few photographs and write a short composition (400 – 500 words) about this event for publication in the Rundschau. Contact Mark Hanson (president@arpca.com) to learn more about the incentives for being a Club Reporter.